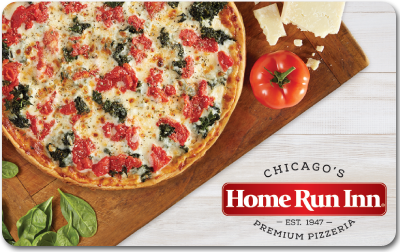 Home Run Inn Pizza gift cards are perfect for any occasion! Select the gift card amount you would like to purchase, add it to your cart, and we will mail your HRI gift card to the address provided. Gift cards are redeemable at any one of our nine restaurant locations in the Chicagoland area. In addition to the price of the gift card(s), shipping fees may be applied. Check the balance on your gift card by filling in your card number below and clicking on the submit button. Your statement with current balances will be displayed for you. For questions regarding your card balance, please contact us.